2017’s theme is empowerment. To me, empowerment means the ability to getting up and getting after the day, finding presence in the smallest of moments, running the extra mile, working the extra hour, and taking on projects that serve a greater purpose. Over the past five years, Fit Approach and the Sweat Pink Community have become my ‘babies’. We started with a vision to inspire fitness in women, college students, and young girls, and even with pivots, progress, and profit along the way, we’ve kept our vision in mind; and lifted it up with each rejection and success. Last week, we hosted our first ever EMPOWER retreat, which reminded me why we do what we do. 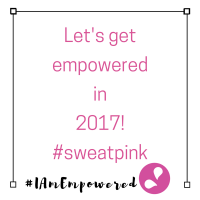 Experiencing a yoga room full of 25 women, sweat, laugh, and get stronger together was one of the most fulfilling moments of 2017, and we are just getting started! Alyse, said it well. We married our two visions last weekend; seeing our community in action, engaging with (and loving) our partners brands in a magical way. This August we are hosting the EMPOWER Women’s Festival, a weekend of running, yoga, and community building in the San Francisco Bay Area. If you’re interested in joining, use the discount code FLEXANDFLOW for 20% off registration. In addition to my sweaty community, I am extremely grateful for my law school community. Over the last 8 months, I’ve found myself surrounded by incredible people. Friends who laugh and cry together through the unbelievably long days/nights of studying, researching, and starting new ventures. Currently, I’m empowered by starting the Venture Law Society with my colleagues and friends, Anna and Tom. In the effort to grow a successful ‘venture’ of our own, we are traveling around Denver: meeting professionals, professors, and entrepreneurs. Last, the amazing love of my life, Alex, empowers me to work hard and learn harder. Building a community of friends and colleagues together, is more than inspiring. It is crazy to think we only have 1.5 months left before our first year is over! In general, entrepreneurs are empowering. As a minority in big and small business, women entrepreneurs who take a risk with their passions, fuel my fire. I decided to pursue law school to help support women entrepreneurs. At Fit Approach, from cosmetics to activewear, I’m thrilled to support and promote women-founded companies. To all the women entrepreneurs out there, let’s strive for forward progress always. Remember what empowers you! My best friends tell me I’m a doer. I envision something that I want, and I do it. I go get it. I believe that giving 100% requires hard work, passion, and intelligence. To truly get something done, or even started, requires the ability to startup. What’s the secret sauce to doing? Surround yourself by other Doers. Want to travel the world? Skydive? Climb a mountain? Run a marathon? FIND someone to do it with, and you’re less likely to back out. Setting weekly, monthly, and yearly goals. I add my goals as “reminders” to my Google Calendar (because it is my life) and receive satisfaction when I can check it off before or by the day! Outline next week’s todos, every Friday. With law school, work, and life todos, I write them down as daily benchmarks for the week ahead. This planning strategy allows me to feel prepared for the week ahead, and enjoy my weekend with little stress. Share goals with my best friends. If anyone will hold you accountable, it is your best friends! I share my life goals with Alex, law school goals with my law school besties, and work goals with my team. Tell those you trust to hold you accountable when you’re slacking! Whether it is teaching a group fitness class, getting upside down, running with my best friend or puppy (@hollythepupster), or pushing myself to the limits in a HIIT Yoga class; sweating empowers me. Exercise is a necessity. Without a daily workout, I am unbalanced. Next Post You’re vegetarian? Like, how do you get enough protein? Needed this – thanks for the inspiration (always.)! !